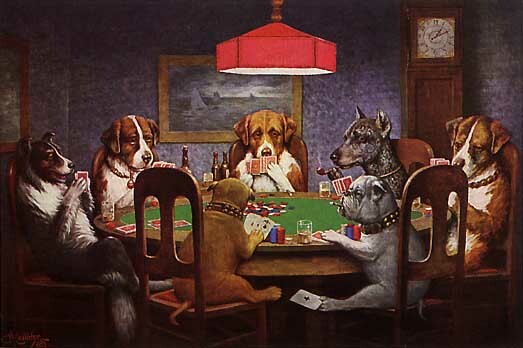 Dogs Playing Poker is most famously known for being a series of sixteen oil paintings put together by the visual artist, C. M. Coolidge. In 1903, he was hired by Brown & Bigelow, a publishing company that specialized in promoting products, to advertise cigars. All of the paintings in this collection illustrate anthropomorphized dogs, or dogs that have human characteristics attributed to them. 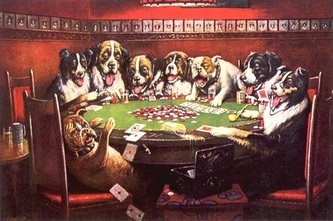 Nine out of the sixteen paintings show dogs seated around a card table; these works of art have become very well-known in the United States. By putting poker-playing dogs in his artwork, Coolidge relates humor to situations familiar to most middle class Americans (during their leisure time, men would meet up and play poker at each others' homes or at the bar). 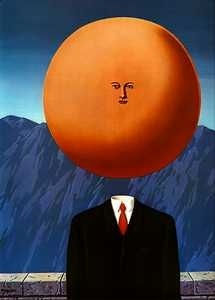 He also connects the art to working class taste in home decoration (furniture in background). 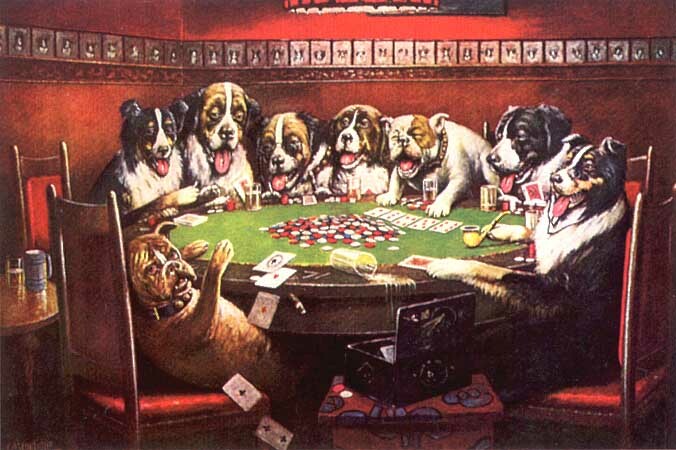 His funny depictions of human-like dogs certainly helped the cigar businesses that he worked for, yet another example of how humor can be used in business. This watercolor painting by Dan Earle depicts a clown laughing. 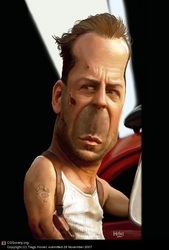 The light that the artist blended into his eyes really emphasizes the fact that he is happy. 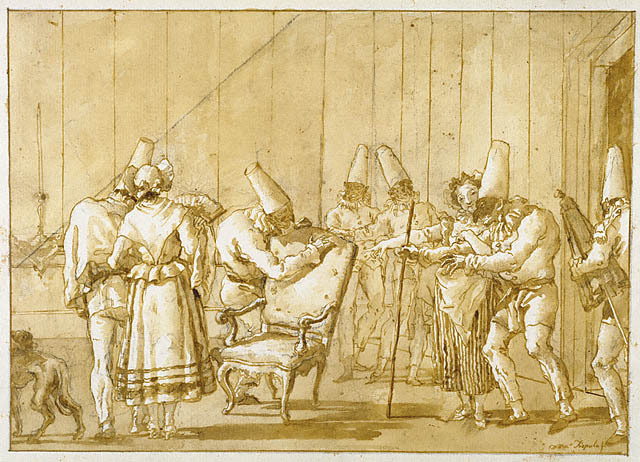 Created using pen, brown ink and wash, and black pen, this work of art is from Italy around 1791. 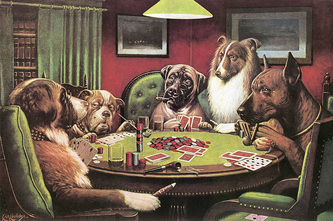 It depicts Punchinello, the man towards the right with the black mask, moving slowly to his chair. 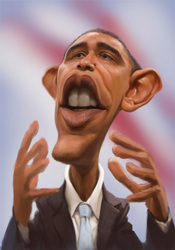 With his big, hooked nose, humpback, and overall stupidity, he was the focus of much humor during the commedia dell'arte, or "Italian comedy," a theatrical presentation performed by professionals traveling in troupes throughout Italy during the 16th century. Other people in the scene are doing various things such as preparing the chair for Punchinello and fetching him an umbrella. While it may not seem very comedic to us in the 21st century, for people back then, it offered them a good laugh. This illustration by Tiago Hoisel symbolizes a number of beliefs, mostly revolving around the idea of how the United States aims to control the entire world. There are five main characters depicted; George Washington, Uncle Sam, a pig, a camel, and "Mount Rushmore." It is clearly seen that George Washington is leading the rest of the group, who are restrained in shackles and chains. Tiago Hoisel points out the irony of the United States by showing George Washington holding both a balanced scale (everyone is equal) and the end of the chain. He is also blindfolded, which implies that the United States does not know where it's going or what it's doing with its "captives." First in line of the captives is Uncle Sam. Although American, Uncle Sam is still in chains; why? Tiago Hoisel is showing how American values nowadays are not the same, if not more corrupt than they were 200 years ago, when Uncle Sam was first personified as the American government. Here, Uncle Sam is a feeble, old man, a ghost of what he once was; the basic foundation and values of which America was based on are now weakened and almost non-existent. Next in line is the pig, which represents China because of the Chinese flag on its back. On top of it is a large safe. Tiago Hoisel shows how the United States continues to borrow huge sums of money from China to pay for its war in Iraq. 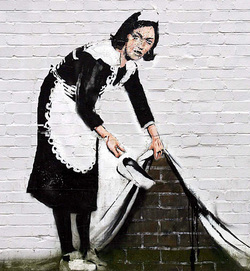 Banksy, an anonymous street artist from England, paints graffiti on public buildings such a brick wall in this picture titled "Maid Sweeping Wall." 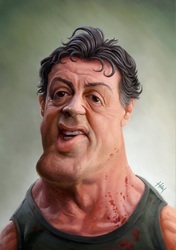 His works of art are usually humorous, putting people or objects in an environment while incorporating whatever he's painting on. The maid in this painting is seen sweeping a brick wall on a street, obviously something that we wouldn't normally see. Banksy creates an illusion by making it seem as if the maid is lifting up a curtain or sheet in front of the wall.